Data Binding is used to maintain a data sink between two systems. We have different data binding techniques when we come to SAP UI5. One-way binding: The data flows from model to the controller. Two-way binding: In two way binding the data flows from model to controller and vice-versa. Aggregation binding: In which we create a local JSON file within the model, which is light weight to store data and directly we can access in the application. Expression binding: In expression binding we can perform certain simple calculations and format the view. OData binding : To access the data in the real server. Now coming to our application. Step 1: Go to Web IDE click on file -> New -> Project from template. Step 2: As we gonna create a SAPUI5 application, select SAPUI5 Application and click on Next. Step 3: Provide project name and descriptor namespace which is our manifest.json file. We create a descriptor to configure our app. Click on Next. Step 4: Provide the view name and click on Next. Step 6: Create a JSON file with in main folder and write the code as follows. Bind the each input field using element binding as below. 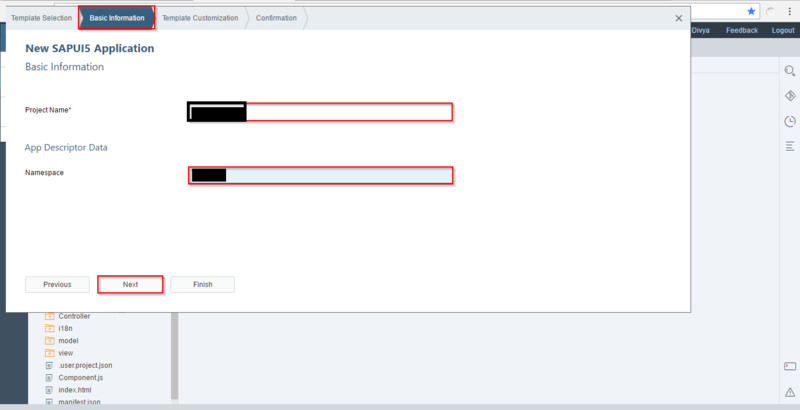 Step 8: ( opensap/nav/Controller/App ) Write the code as follows in the controller. Here we are trying to access i18n properties. All the descriptions and labels are maintained here. In order to configure you application and set the manifest & access our custom styles file, write the code as follows. Step 11: Here we add properties of different components we used in the application like i18n.properties, style.css, Address.json etc. in the sap.ui5 part of manifest.json. Step 12: The output is as follows. Further I will explain Aggregation binding by adding some more functionality.